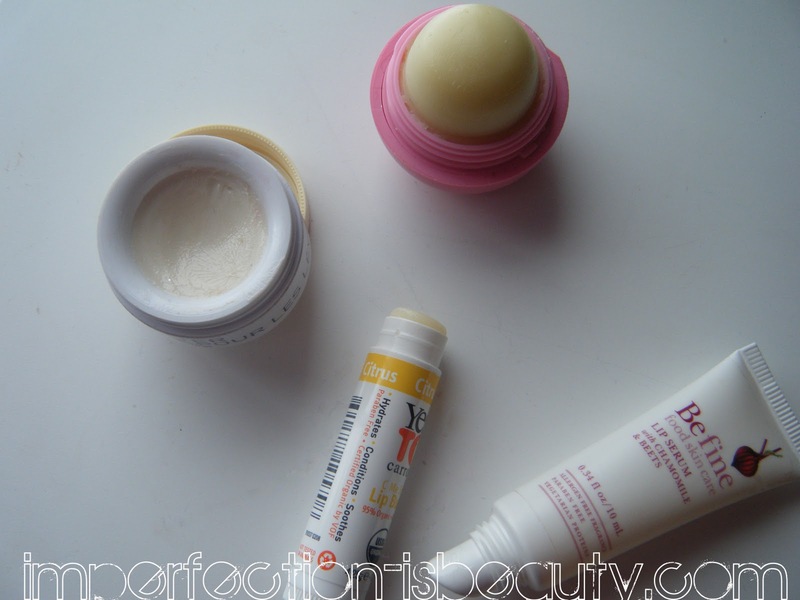 Jennifer Brooks Blog: Dry Winter Lips. During the winter months EVERYTHING is just a lot drier then usual. Skin, lips, hair you name it its probably dry. Although, this winter has been oddly warmer then usual ( Not that I'm complaining) my lips still have been quite dry. However, there has been colder days and these last few days have been a bit chilly and my lips more then anything have been really super dry. 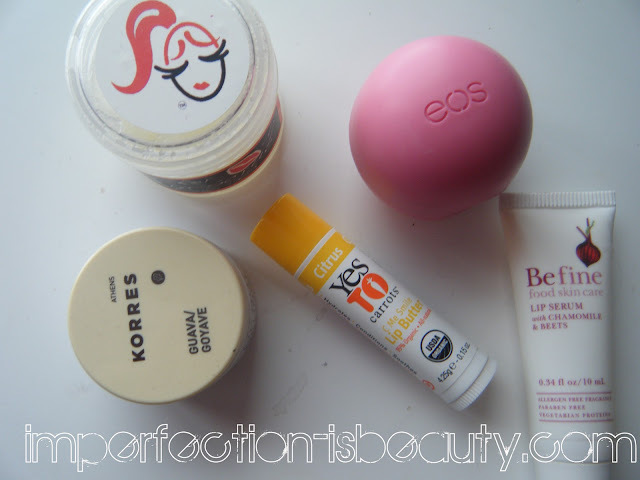 The cure and products I absolutely love and have been using a lot are Eos lip balm, Korres lip butter, Say yes to carrots, Befine food serum, and Belle ame lip scrub. Belle Ame lip scrub is the first thing I use to prevent and get rid of any dryness or chapped lips. 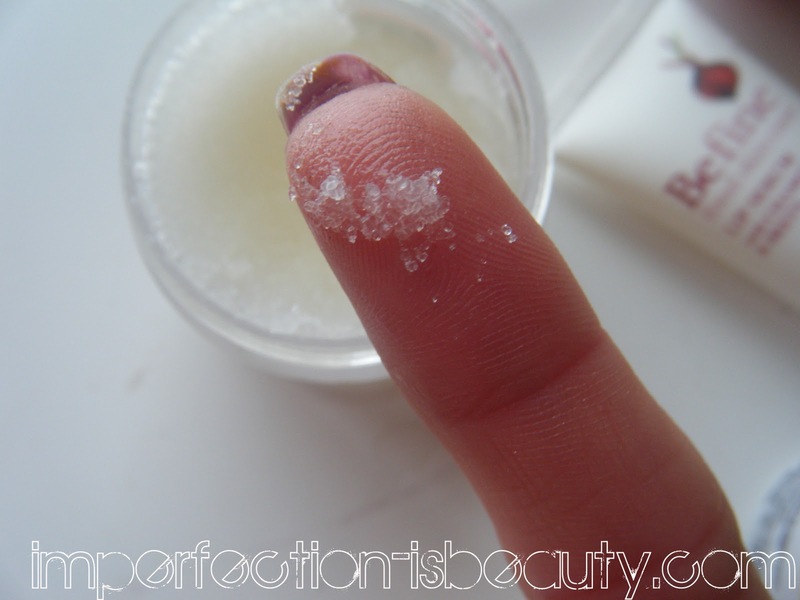 Any lip scrub will do and to be honest theirs so many recipes that you can make your own. Exfoliating your lips is always important because it does help significantly well preventing your lips from chapping. If you have dry peely lips they're more prone to chap, and you don't want that because we all know what a pain it might be. Sometimes its uncontrollable but majority of the time if you just take really good care of your lips and continue to exfoliate once a week then chances are they won't chap in the first place. * I do advise you to be extra careful when exfoliating because you can exfoliate to much causing your lips to become irritated and raw and maybe chap. Yes to Carrots chap stick is a wonderful chap stick if your looking for something that soothes, hydrates, and protects your lips. This is a great chap stick to use to prevent and cure chapped lips. Its very moisturizing, and really makes your lips feel baby soft just after one use. I am fairly new to the yes to carrots line, but so far I have been very impressed. This is rather inexpensive, and the line is made up of natural products, and is paraben free! Eos lip balm has been one of my favorite lip moisturizers for a while now. Not only is the packaging adorable, but the way it feels on your lips is heaven. It also hydrates, and protects your lips. I haven't used it on chapped lips but it does a great job preventing. Befine food lip serum is actually a really great serum. This works wonders on extremely dry lips, as well as chapped lips. I love serums when your lips are already dry because it doesn't normally take very long to heel once you use a serum to really soak up the dryness. This is another natural product, and is paraben free as well. I did get this in my Birchbox and I can say that its probably one of the very few products I loved. Other then the rest of the balms, and chap sticks this leaves a nice dewy finish. Nothing sticky but it does almost look like a gloss. The consistency is more comparable to Vaseline. Korres lip butter is MY FAVORITE lip moisturizer ever. This I did get on black Friday so I haven't had it and used it as long as the others, but it is so so great. Its hydrates, and soothes any flakiness, and dryness. It smells amaz, and it also helps prevent chapping. I actually would prefer a more thicker constancy product in the winter because I feel as though it helps so much better, and faster, then like a eos lip balm. Its on the tacker side, and I would say it's a cross between a gloss and a balm. I do find this is the longest lasting then any of the other ones I mentioned. It does look pretty great over a lipstick. I prefer to use some sort of lip moisturizer on top of a more drying lip stick to make it last one, and two to prevent my lips from drying out. 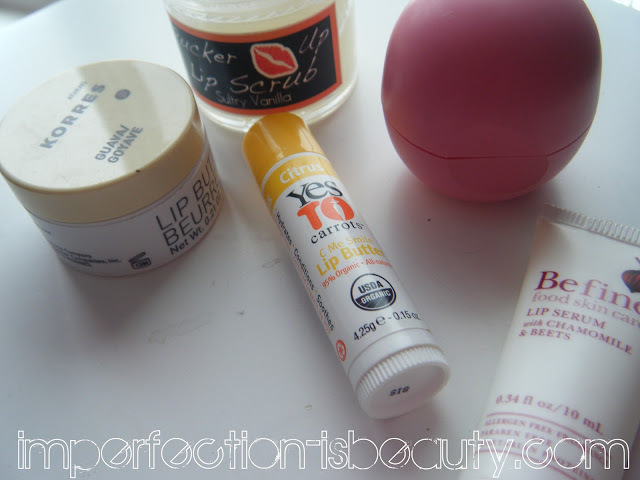 What products do you use during the cooler months to keep your lips baby soft? I hate how dry things get! I will have to try some of those out! ps love the new look on the blog! @Sharon I love the korres its great!! @Pinkglam I NO! I swear everything gets so dry! ughh && THANK YOU!! @Ashley really!! have you tried ulta?